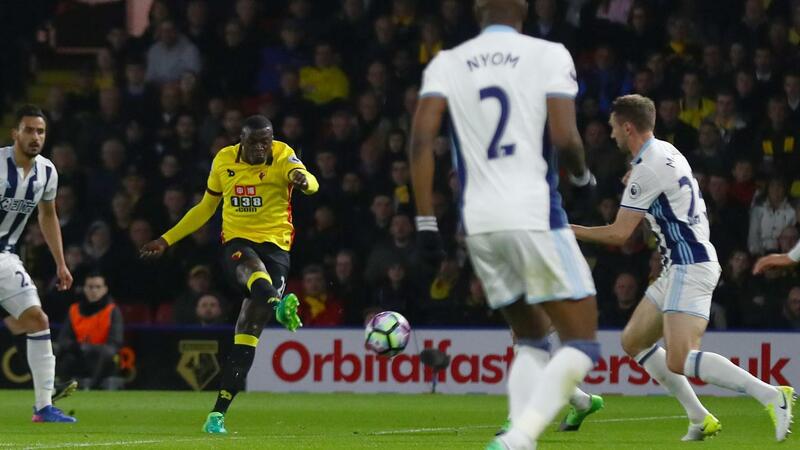 A stunning strike from M’Baye Niang (£5.9m) helped Watford on their way to a 2-0 win over West Bromwich Albion, with the forward also handed maximum Fantasy Premier League bonus points. In addition to his goal, Niang provided the assist for Troy Deeney (£6.9m) to double the Hornets’ lead and registered two successful dribbles and five recoveries to score 46 in the Bonus Points System (BPS) – more than any other player in Gameweek 31 so far. Deeney, who also produced a goal and assist for the hosts, was awarded two bonus points. Recalled to the starting line-up, the Hornets' captain scored 37 in the BPS, losing ground on Niang’s tally having been dispossessed on two occasions and after committing two fouls. Centre-back Craig Cathcart (£4.3m) benefitted from a second successive clean sheet to claim the final bonus point. He recorded 31 in the BPS after completing 81% of 37 attempted passes and completing eight clearances, blocks and interceptions (CBI), along with two successful tackles. Deeney’s 100th league goal for Watford was his sixth in his last eight Gameweek starts, and owned by just 7.4% of managers, he remains a viable differential with penalty duties still a factor in his appeal. Strike partner Niang, with 15 shots over his last six Gameweeks outings compared with Deeney’s eight, also warrants attention, although Watford’s schedule suggests that their long-term prospects could be limited. Three of their next five matches score two in the Fixture Difficulty Rankings (FDR), but they travel to Tottenham Hotspur on Saturday. Testing match-ups with Liverpool, Everton, Manchester City and Arsenal also remain over the run-in. For West Brom, Gareth McAuley’s (£5.3m) 33% ownership endured a zero-point return after he was withdrawn early by head coach Tony Pulis. The centre-back was rested following his recent international exertions but will be expected to figure in the starting line-up for the Gameweek 32 visit of Southampton.